Sleep plays an important role in your baby's growth and development, according to Glade Curtis and Judith Schuler in "Your Baby's First Year." A baby's sleep patterns will continually change during his first year, and by one month, your baby is beginning to notice a day and night pattern, according to Curtis Schuler in "Your Baby's First Year." According to BabyCenter, a newborn will sleep for two to four hours at a time. By four weeks, according to Curtis and Schuler, your baby may sleep for up to five hours at a time. This early in your baby's development, you most likely won't see a napping pattern. BabyCenter recommends allowing your baby to sleep as much as he needs to. In just a couple of weeks, when your baby is 6 to 8 weeks old, he will begin to sleep less often, but for longer stretches, according to BabyCenter. According to William, Robert, James and Martha Sears, "The Baby Sleep Book," babies take at least 20 minutes to fall asleep and enter a stage of deep sleep, which is often why a parent who puts a sleeping baby down, experiences a crying baby just moments later. The younger a baby is, the shorter her sleep cycles are between REM and non-REM sleep. 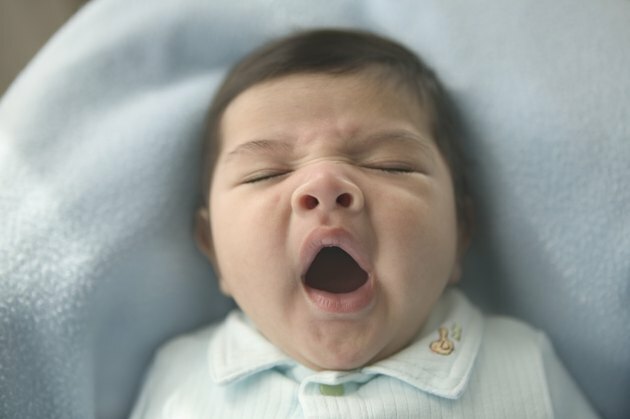 According to the Searses, when a baby switches between cycles, he is more likely to awaken. It is thought that REM sleep is stimulating for brain growth. A baby's sleep patterns are also thought to be protective. A baby who slept so deeply he didn't wake up may miss needed night feedings, or may not wake when a stuffy nose makes breathing difficult. According to the Sears authors, in the first month, babies sleep in three- to four-hour stretches, sleeping equal amounts in the day and nighttime. Hunger is the primary explanation for a baby waking up in the first month. BabyCenter reports that babies have different sleep patterns. Some babies are "cat-nappers," sleeping for less than an hour at a time. If you have a cat-napper, as long as he seems happy and rested during his waking hours, he is likely getting the rest his body requires. Other babies sleep long stretches, others are random sleepers, while others seem to have their own routine, even early on. In a couple months, you can consider a schedule of naps for your baby. At this point, he is too little to fit any set schedule for sleep, according to BabyCenter. Once you are ready to create a schedule for your baby's sleeping times, take note of when he seems to show signs he is tired. According to the Searses, starting the bedtime ritual 15 to 20 minutes before he is tired, will help him transition more successfully to sleep. Once you have a schedule in place, do try to stick to it, but don't stress if there are interruptions.